Look for the floating ‘Best’ cupcakes in Webkinz World from January 16 after the release until February 14. 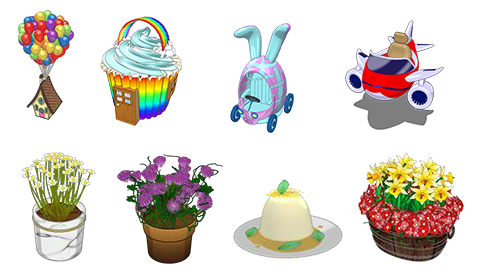 And look for the floating ‘Friends’ cupcakes in Webkinz Newz during the same period. 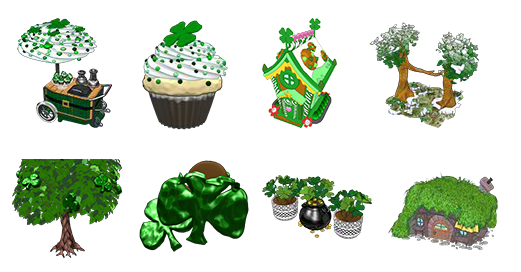 You can also get one cupcake a day from the Lil Blue Sweetheart Cow in the Clubhouse, and the Lil Purple Sweetheart Cow on Webkinz Newz (https://webkinznewz.ganzworld.com/campaign/sweetheart-cow-friends-cupcake/50d0c382299db5.825953187/). 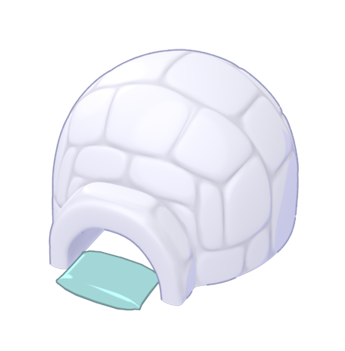 Visit Webkinz Newz for more info after the release on January 16. 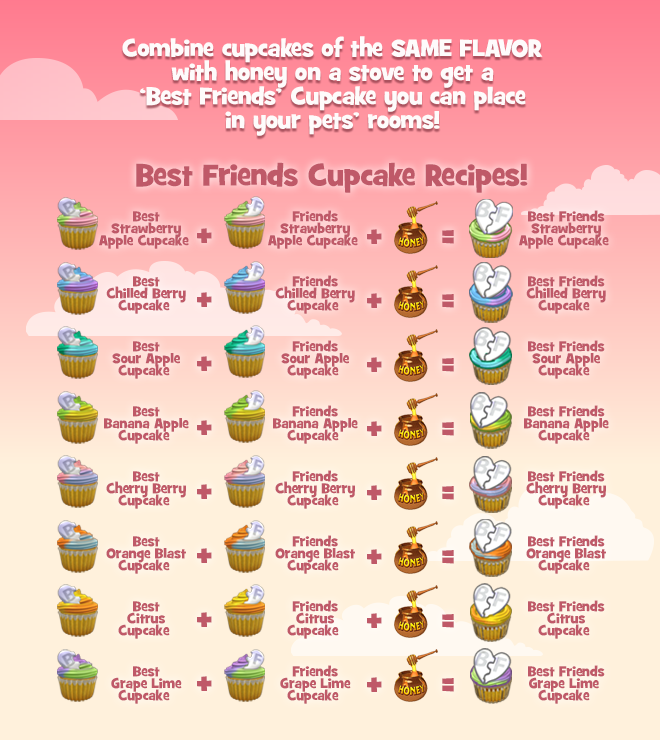 Then when you combine a ‘Best’ cupcake with a ‘Friends’ cupcake of the same flavor on an oven and add honey you get a presentable ‘Best Friends’ Cupcake you can display in your pet’s room! See all the recipes below! Please note: Cupcake recipes will not work until after the release Wednesday. i am so happy the cupcakes we make are items for decorating instead of eating! miracle – the popcorn string should have been a decoration too! Wophy, I got a gift from you..very cute, but wondering if you sent them to me by accident as those items aren’t on my wish list. I live them, but wanted to make sure, as I know it’s easy to accidently send to wrong person! Hi moms! I really love that the cupcakes we make will be items to display too!!! I didn’t get a lot of flakes this year..they were sooo slow! Every month I either got 1 right in first week..or not one at all…frustrating. I’m not even sure how many different times have been out so far.anyone know? 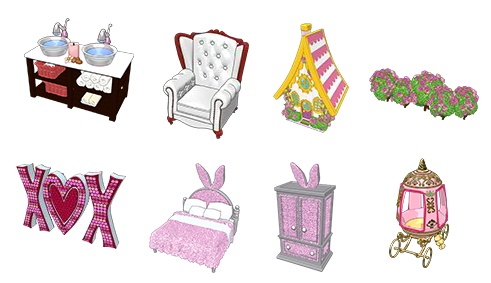 Plus I was wondering if there is a list of the new PAN furniture theme so I can figure out which piece I’m m8ssing?? Boper…. HAPPY BIRTHDAY TO YOU !! Hope you have a great day ! chants… have done PAN many times on different accounts but no luck with the tiles ! Still predicting monster storm this weekend but apparently still thousand miles away… so hoping it takes a wrong turn ! Stopped after work yesterday to fix dinner for my Mom… whole herd of deer in the back yard… searching for food… must have been fourteen at least… wanted to invited them in for scrambled eggs and bacon !!! Checked out estore this morning looking for Deluxe Wednesday… but apparently nothing is available… Is today maintenance day ?? Hope all of you wishing for snow …. get some !! Anyone heard from AmberRose and ME ?? Happy Birthday Boper! Hope it’s a great day! Morning Gymbonians, and HAPPY UPDATE WEDNESDAY!!!!! Up first is PETS! 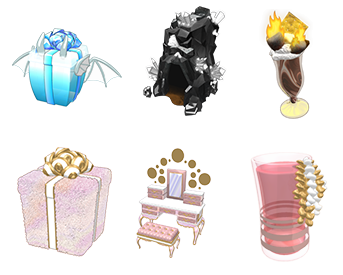 Top row: Dawn Dragon Gift Box, Crystal Hollow, Flaming Smores Sundae. 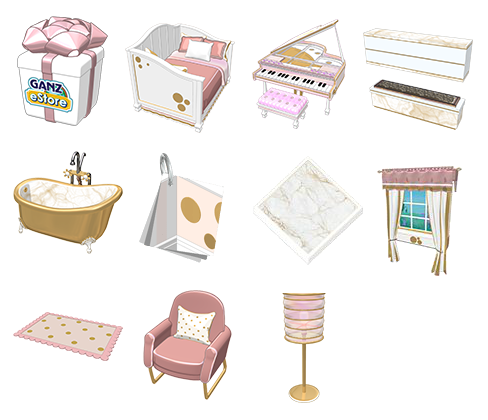 Bottom row: You and Me Puppy Gift Box, You and Me Vanity, Sweet Pink Punch. More pets! 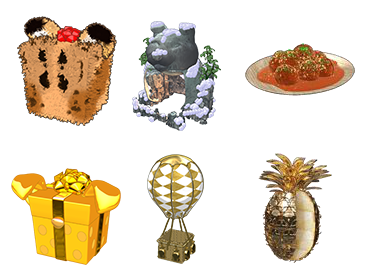 Top row: Cougar Cub Gift Box, Quiet Cave, Sauced Meatballs. Bottom row: Golden Dalmatian, Solid Gold Hot Air Balloon, Pineapple Layer Cake. The aforementioned pets, up close and personal. The rest of the aforementioned pets. Speaking of the You and Me Puppy, he ties in with a new ?? Box Theme, the You and Me Theme. Top row: You and Me ?? Box, You and Me Daybed, You and Me Piano, You and Me Fireplace Divider. Middle row: You and Me Bathtub, You and Me Wallpaper, You and Me Flooring, You and Me Window. 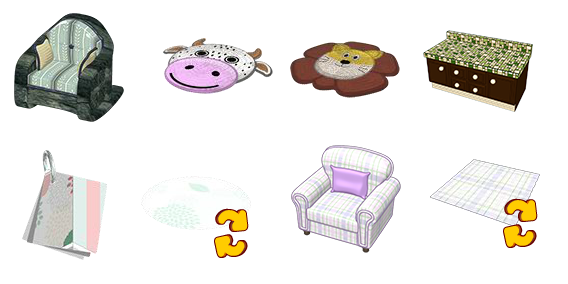 Bottom row: You and Me Rug, You and Me Chair, You and Me Lamp. Call me picky, but when I went to school back in the stone age, we were taught that it’s “you and I”, not “you and me”, so the poor grammar of this theme is grating on me. Jason Mraz and Lady Gaga both agree with me, since they both have songs called “You and I”, lol! 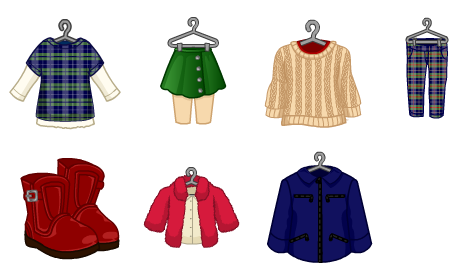 Next up is a theme that is absolutely GORGEOUS and it will be mine, MINE, MIIIINNNEEE! *evil laugh* Sorry bout that, got a little hysterical there! This is called the Cherry Blooms theme, and the pattern is taken from the Cherry Blooms dress that was in the KinzStyle Outlet about four years ago in the Spring line. GORGEOUS! 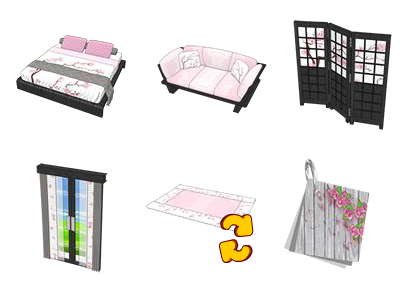 <3 <3 <3 Top row: Cherry Blooms Bed, Cherry Blooms Sofa, Cherry Blooms Divider. Bottom row: Cherry Blooms Curtain, Cherry Blooms Rug, Cherry Blooms Wallpaper. MUST HAVE IT ALL!!!! *As promised during my campaign, the first-ever Player Appreciation Day is on Saturday, January 26th! 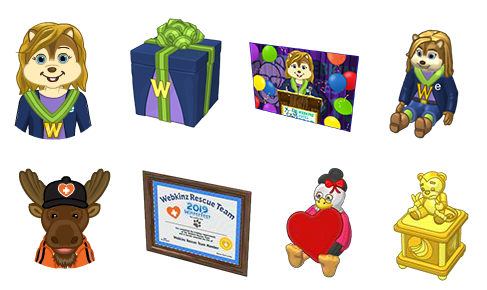 Log in to your Webkinz account on either web or mobile to receive this month’s prize: a 3 pack of 2017 Winterfest Cookies! You’re sure to get some cool prizes when you feed them to your pet! Mayor Sophie has yet to post the updated wheel prizes, so that is all the information I could ferret out today. Until next time, this is TheSpoilerLurker signing off. This post will self-destruct in 5…4…3…2…1…BOOM! Thanks for all the info, Spoiler! I love the Cherry Bloom theme, too! Thanks for the fun, Boper! Congrats to Gramma & Miracle for winning the contest! Oh, and btw, Happy Birthday Boper! And congratulations gramma and Miracle! Enjoy your cool new prizes! let’s move over to the new spoilers post!! !